← Things We Learned From Heathers. I know. I know. 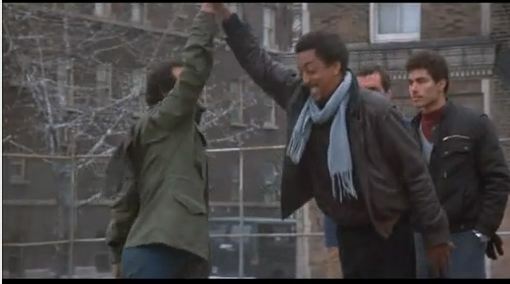 I didn’t write a Tuesday Tribute, but it’s not that I forgot, it’s just that I wanted to pay tribute to Gregory Hines, and I couldn’t decide if I wanted to pay tribute to White Nights or Running Scared. I’ve come up with a solution. This week: Running Scared. Next week: White Nights. That’s right. Two Gregory Hines posts in as many weeks. What’s wrong with that? Who the eff are you? The Gregory Hines police? You know there’s no such thing, right? Idiot. Just kidding. I got the idea to pay tribute to Mr Hines when Sonia, of The Sonia Show, blogged about that awkward moment when an urbanite wonders what the hell everyone is looking at, and an islander rolls her eyes and says, “It’s the sunset, stupid!” Which of course made me think of the second most bromantic Gregory Hines movie ever made (come back in one week for the most bromantic one…I bet you can’t guess what it is), the 1986 buddy-cop movie, Running Scared, starring Billy Crystal and Hines as Chicago Cops who get tired of the snow and bullets and decide to retire to Key West, Fl. About 12 years ago, I got tired of the snow and bullets and snow in New Hampshire and did pretty much the same thing. I chose Key West because I’d heard that it was THE place for writers to go and write. I soon learned that it was THE place for writers to bartend and drink. Still, I never once took that sunset for granted. This video doesn’t do it justice, though. It does do Gregory Hines justice…he spends most of it sporting a banana hammock. WHAT?! … Stupid Gregory Hines Police. Still no such thing…grumble…. This entry was posted in Miscellany, Tuesday Tribute. Bookmark the permalink.